This week I talked about some of the auditory memory tasks I use in therapy to help improve memory recall for auditory information. So today I’m sharing an quick freebie that offers a list of associated words as well as 3, 4, 5 digits for immediate and delayed recall. This list is meant for a quick reference so SLPs do not have to start from scratch or recreate the wheel. 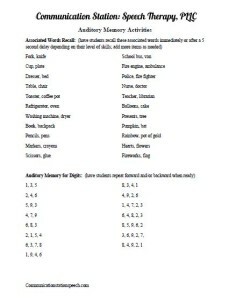 The list is simply for these auditory memory tasks and the goal is to improve memory recall skills in order to move as quickly as possible to memory recall of language (key words in short then longer sentences and memory of details in short then long narratives). Tip Tuesday: “Talking and Seeing” Techniques! Tip Tuesday: Auditory Memory Activities! ← Tip Tuesday: Auditory Memory Activities!